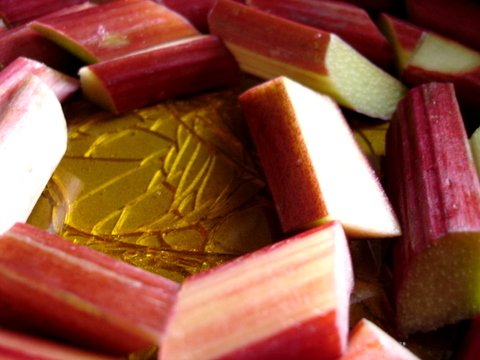 For those of you eyeing the rhubarb in the shops unsure of what to do with those rosy stalks, may I heartily recommend a rhubarb tarte tatin? It was Everyday's idea, not mine, I should hasten to add, but having made one once with her (and her lovely seasoned cast-iron skillet) I was eager to try it again. We weren't entirely convinced by the flavor of the star anise called for in the Guardian's recipe, but I wanted a bit of spice, so I threw in a few black peppercorns when making the second tarte, fishing them out before the caramel hardened; also, if you like me lack an overproof skillet, know that you can simply pour the liquid caramel into a baking dish and let it cool there, enjoying the tinkling music it makes as it cracks. I haven't been in previous years, but I'm sure everyone even half as excited about ceramics as I am should join me in checking out the Pankow Keramikfest this weekend. I have been eyeing Stefanie Neumann's radiant turquoise and ivory porcelain plates for some time and look forward to taking a closer look at them tomorrow, along with all the other works on display. And when the gorgeous weather seems to stretch on forever, then it's time to board the S-Bahn and finally make the journey down to Mutter Fourage. 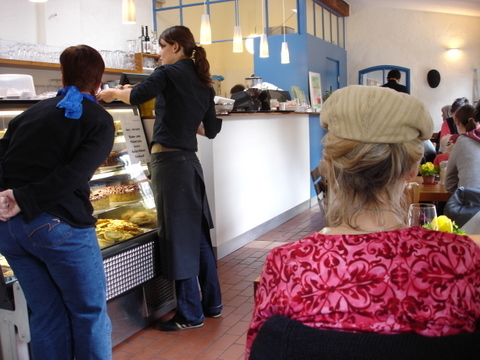 David and I were sure any Slow Food affiliate would be worth the trip, but were doubly pleased to see their lunch menu was exclusively vegetarian, and packed with dishes each as tempting as the next. After very careful consideration we opted for the creamy potato and black salsify gratin paired with the best salad I've had since our friend Áine was last in town, and decided that we'd have to revisit this garden center/cafe/organic grocery shop/concert venue/art gallery later in the summer. After your meal, be sure you visit the side garden with the chickens in their tidy coop -- and you might take a further leaf from our book and unpuzzle the bus schedules to swing by the Max Liebermann Villa before heading back to the city center. 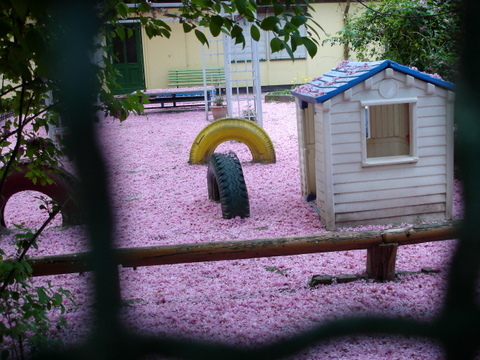 Can you believe the dreamy elegance of this playground blanketed in spent blossom? I don't think it's too late to plant the so-called summer bulbs, though you'd do best to be quick. 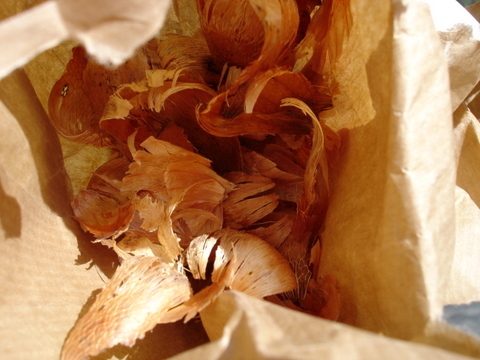 After the soothing work of peeling off papery skins, I placed the gladioli and ornithogalum in their pots, then waited. Five of the ten gladioli have already sent up their mulberry shoots the ornithogalum has not yet done much, but I'm waiting. Meanwhile, the first set of coriander seeds have sprouted their cotyledons and a few pioneers have even moved on to the frilled leaves of coriander as we know it; the parsley and chives lag behind but gain ground daily. And would anyone like to join in the fun? I've overbought and a paper bag full of packets (herbs mostly, with a few blooms) sits on my desk waiting to be shared.